TWIGGY WAS ADOPTED AUGUST 23, 2008! 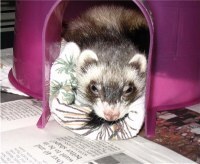 The shelter staff arrived one morning to find an incredibly filthy ferret cage, tied together with coat hangers, at the shelter door. 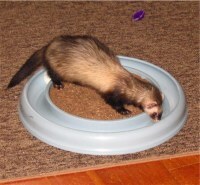 Inside was Twiggy, a young sable ferret, under 1 year old. Her water bottle was green with mold and contained no water. The shelter staff power washed the mounds of dried feces out of her cage, tossed out the dog food and pretzels (EEK! 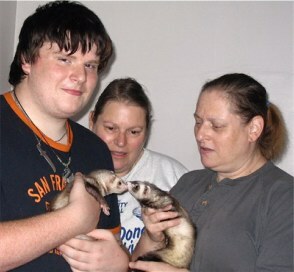 - NOT proper ferret food!) that were in her cage and gave her clean water. She promptly drank 1/3 of the water in the bottle. The shelter then called Companion Critters to see if we could take her into a foster home. So in a foster home she is. We found her to be very sweet, spunky and playful. She is not nippy. Twiggy shares a room with foster cats (in a large cage, of course) and they all seemed to want to interact with one another. So under strict supervision Twiggy was cut loose with the cats for a little play time. 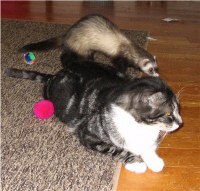 Let's just say that seeing a tiny little ferret chasing two adult cats around is about the funniest thing we have ever seen! The cats chase Twiggy, then Twiggy chases the cats. They have a blast together. So Twiggy is allowed supervised play time with the cats several times a day now. At first Twiggy did not seem to be getting the hang of her litter box (she never had one before) but after a couple of modifications like anchoring the litter box to the corner of her cage so she can no longer get behind it and changing the litter to Swheatscoop, which she likes much better than Yesterday's News, she uses her litter box consistently. In fact, if she is loose in the room playing with the cats, she will go back in her cage to use her litter box when the need arises. And after just two days of litter box experience - what a smart little girl! 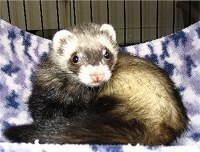 Twiggy was seen by our veterinarian and has received her rabies shot. The distemper shot cannot be given until two weeks after the rabies shot. Twiggy has a skin infection on her belly because of the filth she was living in so that is being treated with antibiotics. Our vet said Twiggy is a very, very sweet ferret and she was impressed with how well behaved Twiggy was for her nail trimming. Twiggy has been spayed. Her adoption fee to help cover her vet costs is $50.